As a compliment to laser therapy and chiropractic manipulations, our office also offers non-surgical spinal decompression therapy. 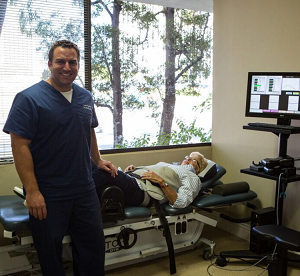 Non-surgical spinal decompression therapy is a technologically advanced procedure and is used to help relieve low back, neck, and radiating leg and arm pain. This type of treatment is helpful in relieving pain associated with disc herniation and degenerative disc, due to compressed spinal disc and facet joints by utilizing traction, distraction and positioning. During the non-invasive treatment the patient lies down on a table and a computerized guided pulley system cycles through distraction and relaxation phases to gently relieve pressure. “Eighty-six percent of ruptured intervertebral disc (RID) patients achieved ‘good’ (50-89% improvement) to ‘excellent’ (90-100% improvement) results with decompression. Sciatica and back pain were relieved.” “of the facet arthrosis patients, 75% obtained ‘good’ to ‘excellent’ results with, decompression.” C. Norman Shealy, MD, PhD, and Vera Borgmeyer, RN, MA. Decompression, Reduction, and Stabilization of the Lumbar Spine: A Cost-Effective Treatment for Lumbosacral Pain. American Journal of Pain Management Vol. 7 No. 2 April 1997.